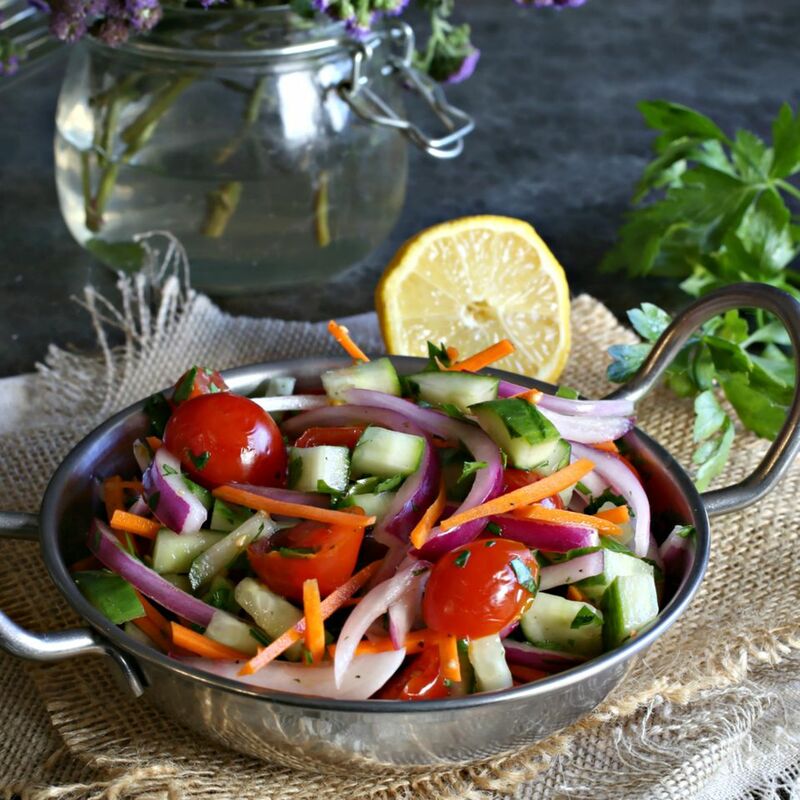 Cucumbers, tomatoes, and onions are a salad combination that's found in many countries—the Middle East, Africa, and Mediterranean all have their own variations, for example. In India, the refreshing trio is known as kachumber. What makes kachumber unique is its dressing, which doesn't contain any oil, but rather freshly-squeezed lemon juice, salt, and pepper. Kachumber resembles several staple salad dishes from other cuisines. Kachumbari (a name derived from the Indian word kachumber) is a fresh tomato and onion salad that is popular in the Great Lakes region of Africa and can be found in Tanzania, Uganda, Burundi, Kenya, and Rwanda. Although it sometimes contains chili peppers and citrus, it might also arrive at the table as just salted tomatoes and onions and used as a condiment. Israeli salad, sometimes called Arab salad, uses similar ingredients in the form of chopped or finely diced tomatoes, onions, cucumbers, and sometimes bell peppers dressed with lemon juice and salt. Known as one of the national dishes of Israel, it is served with almost every meal. Indian kachumber can be made in a number of variations. In addition to extra vegetables, such as radishes and carrots, it can contain vinegar as the acid instead of lemon juice, fresh mint along with cilantro, and seasonings such as ground cumin or garam masala. Other twists include the addition of spicy chili peppers or a dash of cayenne pepper in the dressing. Whatever the cuisine, all of these salads serve as staple additions to meals. The cool, refreshing nature of kachumber can easily take the place of a slaw next to burgers and sandwiches, be served as a cooling complement to spicy curries, or tossed with thick Greek style yogurt to make a chilled dip. The combinations are truly endless. Peel and dice the red onion. If you'd like the onion to have less of a bite, soak them in water for 15 minutes, drain, and then add to the salad. Half or quarter the tomatoes, depending on their size. Slice the cucumber in half, lengthwise and dice. No need to peel or seed if using English cucumbers. Peel the carrot and slice using a julienne peeler or regular vegetable peeler. Thinly slice the radishes with a sharp knife or mandoline. Seed and dice the jalapeno. To reduce the heat, remove the veins as well as the seeds before dicing. Add all the cut vegetables to a large bowl and toss with the cilantro, lemon juice, salt, and pepper. Season with the ground cumin, if using.